Both Aquarius and Taurus are very independent and strong individuals with fervent ideas which may clash from time to time. Both want stability in life and partnerships but Aquarius is an explorer in nature while Taurus loves to stick to the tried and tested things. With sincere efforts this combination can work well. When you consider the elements of Aquarius and Taurus, it’s clear that there’s a basic mismatch here. Aquarius, the air sign, doesn’t need earth much. 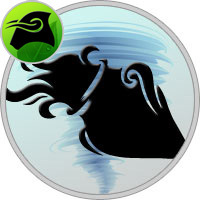 Earthy Taurus is shaped by the wind of Aquarius, but can also be caught up on the dust storm that ensues, causing misery all round. For Aquarius and Taurus, compatibility may be fleeting in a romance. The relationship fares much better as a friendship or as a business partnership because neither party then has so much to lose. Taurus sign compatibility is much more flexible if love is not on the line, and Aquarius will get along with anyone on a platonic level. Romantically, however, it’s a rare Taurus/Aquarius couple who can make it work – the odds are simply stacked against them. Compatibility and comprehension between Aquarius and Taurus is possible, but not without efforts. It takes time and effort on both sides to break down the bashful barriers of Taurus as well as the detachment of Aquarius. Perhaps then, and only then is there the possibility of a unity. Once this unity is established, Aquarius and Taurus complement each other very well and are not likely to fall apart. The combination of the two is a union that brings a stable presence and an imaginative and powerful future. Their time together is exciting and wonderful for both of them. Taurus wants to unleash the passion, sensuality and desire they have to offer while Aquarius stays a bit unapproachable, perhaps even detached usually. Aquarius stays untouchable, keeping ahead of the chase and this induces jealousy in Taurus. Both are stubborn and may quickly find a trivial reason to turn them into adversaries. Aquarius and Taurus always find each other very interesting and are always enthusiastic about the relations they form with each other. As friends, siblings, colleagues and relative, they share an exciting and joyful relationship full of fun and love. In commercial partnership they can work well with their skills which are different but necessary for success. A romantic relationship cannot be smooth especially in starting as Taurus needs lots of devotion while Aquarius takes everything in an easy going way. Time is needed to make them a strong couple and sometimes that might not even work out. As parents they both understand their responsibilities well and give their children everything that is essential to have a secure and memorable childhood. While personally they love to recall their childhood memories and their parents are always an important part of their life. Aquarius and Taurus have never ending differences, out of which some are interesting while others lead to clashes. They are sometimes two worlds apart and sometimes just flowers of same garden. Taurus may find Aquarius too idea oriented and be demoralized by the off the wall thought patterns of Aquarius. Taurus loves tradition, while Aquarius evades this way of living, leaning more toward innovations of the future. Aquarius resists merging and can live in the mind, while Taurus craves physical intimacy and sensual pleasures. Aquarius also treats money as a pleasure while for Taurus money is worship and they handle it with utmost care. On the positive side, Taurus can manage the day-to-day, and Aquarius comes up with the big picture plan which works well together. If they can handle the gap that naturally exists between them it could very well work and can lead to some awesome relations and partnerships. Taurus woman and Aquarius man are able to create a beautiful marriage which evolves with their strong bond of love. He completely admires his Taurus lady but he is not very sure of his capabilities to take his relationship to higher levels. He may take time to understand his own self before making any commitments to his lady but once he makes a promise, he makes sure that he keeps his partner happy. The purity of their love brings them close. He is a great listener who is always there to act as a strong support to his lady and also respects her individuality. Taurus lady turns out to be the most loving and caring wife for him. She only needs commitment from her man and once she gets that she showers him with utmost care and love. She is a partner for life who keeps her man happy by taking care of all his needs along with his home and kids. She is surely the best cook and truly complements the easy going approach of her man. She is a true friend and a companion for life who loves to explore the world with her Aquarius man. With time, he also learns to be more stable and expressive to his lady thereby adding more sweetness to their relationship. Once they bond together, they are able to enjoy a smooth and happy relationship which is free from all kinds of insecurities and doubts. They add new colors to their life thereby making it more interesting and happening. They learn new things from each other and their friendship becomes the strongest pillar of their relationship which helps them understand each other in a much better manner.